Make sure to avoid running shoes that have a lot of mesh. Instead look for shoes that are made up of Gore-Tex which is often water proof and will keep your feet dry from any slushy puddles. Shoes with a grippy sole will help with stability on slippery or wet surfaces. Trade in the bulky winter coat for a wind and water-resistant shell coat. As the body warms up during your run, a heavy winter coat can cause overheating and become too restrictive. The natural rise in your core temperature along with a light lined shell coat should be enough to keep you warm. Consider dressing in three layers, base layer, insulating layer and wind resistant shell layer. 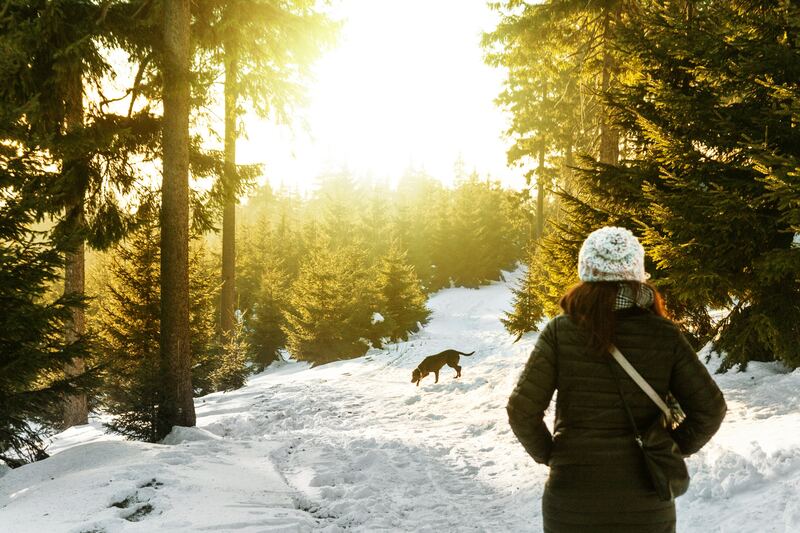 Hats (especially wool), gloves and neck gaiters and face masks can cover up exposed skin and prevent frost bite. A proper warm up cannot only reduce your risk of injury but it should also increase your heart rate and your core temperature before you run. Dynamic stretching is ideal for a warm up as it designed to warm up the muscles specifically used for running. An ideal pre-run stretch would be the Dynamic Leg Swing as it warms up the largest muscles in the leg and the core. Begin standing with one hand supported against a wall/chair , etc. Swing for 15 reps, then switch to the other side. Colder air does put more pressure on your lungs which can affect your breathing as you run. Having to navigate on slick icy sidewalks will also compromise your runs. Hence, winter might not be the best time to reach for a personal best. Take a slower pace and plan your routes to avoid icy sidewalks and find clear paths. If you have to run on roads makes sure to sport reflective gear and consider running during the day as opposed to at night. Get warm as soon as you’re done. As soon as you stop running, your core temperature drops. Therefore, you want to warm up both internally and externally right after your run. To warm the body up externally it is important to remove any wet or damp clothing as soon as you finish your run. This includes your hair; a dry wool cap can help prevent a drastic drop in temperature. Post run, warm fluids or a healthy soup, can help replenish protein while warming you up internally.